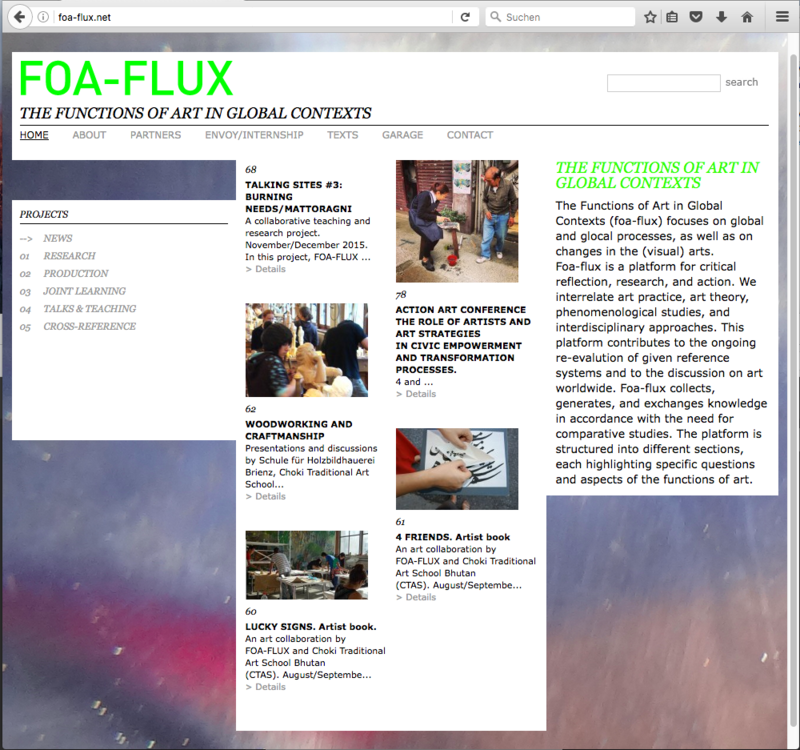 Together with Annemarie Bucher, an art and landscape theorist, I co-run the research platform FOA-FLUX (foa-flux.net). We focus on the functions of art in global contexts, Art in Action, “artists working reality,” and work in changing (trans)disciplinary, cultural teams. Please refer to our webpage for further information. 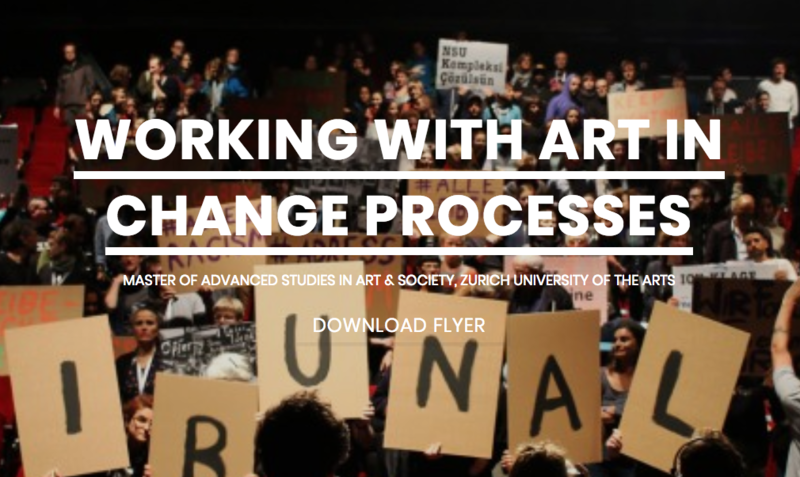 Based on our research we conceived the study programme Master of Advanced Studies in Art & Society (artandsociety.net) for Zurich University of the Arts (ZHdK). 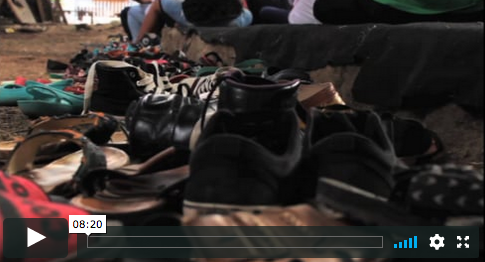 A series of Visual Notes (short films). Concept by Grace Samboh and Dominique Lämmli. Filming and editing by Sandra Bühler. 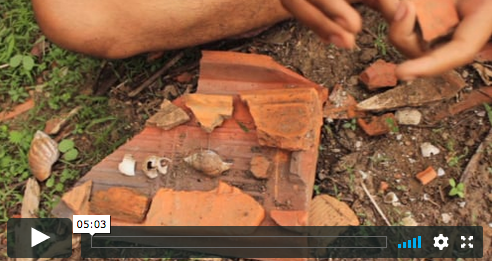 Kadus Ila on his work with JaF and the construction of a tile history museum in Jatiwangi. — Encourages artists, theorists, and cultural practitioners to share and improve their knowledge and skills beyond and across institutional research frames. — Seeks to stimulate networking and collaborative projects, to foster research exchanges, and to support talented individuals beyond established institutional support. — Envoys attend, observe, and report on conferences, exhibitions, and other events of interest to promote knowledge exchange and networking. As an intern you will be assigned to particular project teams, acquire skills and make contacts. An internship at FOA-FLUX will give you an opportunity to get to know and understand some of the ongoing paradigmatic shifts in the arts. The collaboration of FOA-FLUX and the Choki Traditional Art School Bhutan dates back to spring 2010. 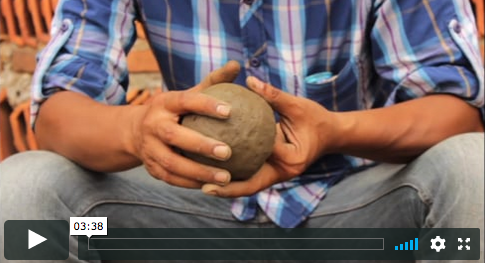 Since then, workshops and collaborative art production took place in Zurich, Bhutan, and India. In August 2015 FOA-FLUX and CTAS worked together on two artists books: LUCKY SIGN and 4 FRIENDS. Together with a delegation from Zipatso Academy (secondary school) Malawi, FOA-FLUX and CTAS also visited the Holzbildhauerschule Brienz, held and listen to presentations, followed by discussions on woodworking and craftsmanship. Mahroo Mohavedi, an Iranian artist, currently based in Zurich. She studied painting at the Art University of Isfahan and Transdisciplinary Studies at Zurich University of the Arts (ZHdK). Nistiman Erdede's participation at the Decolonial Summer School Middleburg/Netherland 2016 on Stolen Memories: Museums, Slavery and ( De) Coloniality was a success story for all sides. Thanks to privat sponsores Nistiman was able to join the course and to develop a distinguished topic to work on in the future. His text entitled A Letter to a Friend/(De)Colonise the Table reveals a personal recollection of individual experiences, collective memories, historical facts, and explicit spaces inbetween. it is a promising starting point for further research and action. Since 2010, Nistiman has been working individually and collaboratively on the topic of the replacement of this symbolic table. FOA-FLUX Envoy Scholarships are made possible by private sponsors. The symposium focused on sharing experiences and know-how on art projects informing everyday life, social processes, and scientific fields. Organized by FOA-FLUX, Srishti Institute of Art, Design and Technology Bangalore and swissnex India. With speakers from India, Indonesia, Hong Kong, Norway, and Great Britain. Upasna Bee, visionary film-maker, photographer and journalist. Studied at Srishti Institute of Art, Design and Technology Bangalore/India. Vinay Kumar, blogger and student. Studied English Literature, Journalism, and Psychology. Based in Bangalore/India. A collaborative project between Nanzikambe Arts (Malawi), The Newcastle Creative Network (South Africa), and FOA-FLUX (Switzerland), and in close partnership with The Blantyre Arts Festival (BAF), the Visual Arts Association (VAAM), and Zipatso Academy Salima. Sandra Bühler, filmmaker and new media artist, MA Fine Arts alumni at Zurich University of the Arts (ZHdK). Sponsored by the Institute for Contemporary Art Research and Connecting Spaces Hong Kong – Zurich, Zurich University of the Arts (ZHdK). An international conference. Venue: ZHdK, Toni-Areal, Zurich. 5 students in the organizational team. 6 students and 2 alumni contributed to the programme. A field research and production of Visual Notes on Java/Indonesia. Accompanied by a research colleague from Hong Kong Baptiste University. 1 student. Presentations and discussions by Schule für Holzbildhauerei Brienz, Choki Traditional Art School (CTAS), FOA-FLUX and invited guests. Venue: Schule für Holzbidhauerei Brienz. 1 alumni. A project by FOA-FLUX and Srishti, Institute of Art, Design and Technology, 3 MFA students. A project by FOA-FLUX and Newcastle Creative Networt South Africa, at the invitation of the Blantyre Arts Festivals Malawi, 2 MFA students, 1 alumni. Research exhibition by FOA-FLUX for Connecting Spaces Hong Kong — Zurich, Connecting Space Hong Kong, 2 MFA, 1 BFA students, 2 alumni. A roundtable discussion, in the context of the Art in Action research exhibition in Hong Kong, organised by FOA-FLUX and Hong Kong Arts Centre, 1 MFA student. Research exhibition by FOA-FLUX and Connecting Spaces Hong Kong — Zurich, Museum Bärengasse, summer, 1 MFA, 5 MTR, 1 BFA student, 2 alumni. A project by FOA-FLUX, CHOKI Traditional Art School Bhutan, andSrishti, Institute of Art, Design and Technology Programm, venue: SrishtiBangalore/India, 2 MFA students. A roundtable discussion organised by FOA-FLUX at Connecting Spaces Hong Kong, 1MFA student. A workshop by FOA-FLUX, MA Transdisciplinary, MA Fine Arts, and the Chinese University Hong Kong, venue: CUHK, 5MFA, 7 MTR students. Exhibition in the context of the workshop in Hong Kong (see also info above), Museum Bärengasse Zurich, 5MFA, 7 MTRstudents. A workshop by FOA-FLUX andCHOKI Traditional Art School, venue: CHOKI Thimpu/Bhutan, 5 MFA students.